Not sure how I missed this as I've been checking Fusion Gameworks for a while. Once the source is public it's not going to matter much if people do multiple forks of it - everyone will know where it came from, there isn't nearly as much interest in it vs the Mario engines on Fusion Gameworks and don't get me started on the engine itself. No need to worry about it getting "ruined". Optimising the soundtrack is most likely using OGGs instead of MP3s, using better quality tracks in the first place and maybe a bit more loop point usage to bring the file size down. FMOD/GMFMODSimple not only supports OGG with loop points but a lot of other formats as well so it makes sense to make the most of it. Hello again! I decided to check back in this thread to see if there was any progress toward the final version of the game. It's been a while since the last update so I thought it would be finished... But I know real life happens too. Also, I recently tried to download the current version, but the files don't appear to be there anymore. Man, try this alternate link, it is from my own account from Media Fire. Alluro, sorry because I asked not for your autorization, man, if you want, I'll remove the pack. Unfortunately, after several testes, last versions 10 and 11 suffer too many bugs and crashes, when we play on versions 7 64 bits and 8.1 o Windows. The OS is not the problem, there was an issue with the code for drawing the high score table in v0.11 that crashes the game at the end. Win8 onwards has DirectSound compatibility issues so sfx playing may crash, which is part GM part Win8. Win8 onwards has DirectSound compatibility issues so sfx playing may crash, which is part GM part Win8. To elaborate: On the Windows side, it's their new audio DLL that's causing problems. On the GM side, it's because GM8.1 and below merely overlay sounds on the same channels, which causes the newer Windows audio DLL to get confused and crash the game. Although there's a workaround (stopping a given sound when attempting to play another instance of it), it's not foolproof. GM:S's new audio system fixes this issue, but porting XFR onto it is a whole different beast. Also, this is my 404th post. I am error. Just came in to give BPZeBanshee full permission to take over Xeno Fighters R and handle its development from here on out. A lot has changed for me in the nearly 11 years since starting Xeno Fighters R. I'm done with fangames. I am done using Game Maker. I also have moved on from shmups in general, as I want to focus on different games rather than just one genre of games. Instead of making fangames, I have begun working on original independent game projects with a group of other people, and we plan to sell our original games commercially. I am no longer the angry immature individual I was in 2008 or so. Untreated severe clinical depression and lack of coping skills with my past left me to use anger as a way to delude myself into thinking I had control. Therapy and medications helped me have control over my depression now, instead of the other way around all my life before. To show I have changed and moved on from my dark past on the internet, I have retired the Alluro, Alluro95, and Judge Spear usernames, and now I use a name that's based on my real name. Thank you all for the memories and the good and bad times being part of the shmups community. I want to move on to different things now. Thanks for the memories, shmups community! 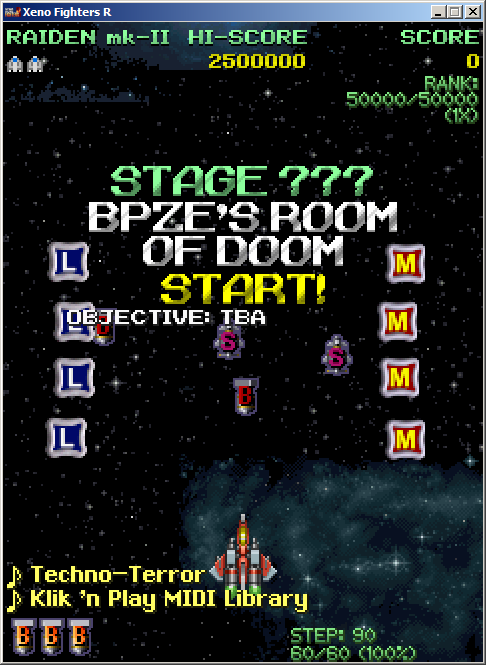 That reminds me of Gustav’s Games like Odd Mobs Zero Arrange; it crashes after defeating the second boss and somehow the same with Dotonpachi Maximum. Because Gustav’s games are also made with Game Maker. Just saw this, really exciting. BP will definitely do this justice. You've always seemed pretty great to me. I know you've had to deal with a lot of drama in your time, and I've never blamed you for getting irate over any of it. I am glad that you do feel better about yourself, though. Getting out of fangames and moving onto bigger things is always the right thing to do. Don't forget shmups though. I hope you'll go on to make an interesting new shmup someday.